In the dialect of many populations of the Western Alps “Génépy” is the name, probably of Celtic origin, a mountain herb, Artemisia Glacialis. A plant that grows over two thousand meters above sea level on moraine land, which is collected carefully, without removing the root. By the shepherds of the high valleys of the Aosta valley region it has always been described as a medicinal plant with a delicate fragrance, of which was already said in the ninth century that ” it is close to having as many virtues as it has leaves” . The rarity of Artemisia Glacialis causes the production of this product to be very limited and sought after, it is consumed by a select few who know the virtues. This fine liqueur is the result of a centuries old knowledge of distillation and herbalism conjugated to an innovation and search for taste. 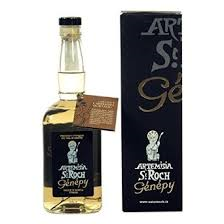 DISTILLATION Obtained by infusion and tincture of génépy, aging in steel tanks for a month.